We have put together a short list of the top five reasons you should invest in a Fabric Exhibition Stand – the key points if you will. We have spoken in length many times before about why fabric displays are the best and why fabric displays are the future and this list of top 5 reasons can be referenced as a handy go-to guide whenever you find yourself stuck between which display solutions to choose. 1) Improved Print Quality: No other exhibition stand solution produces such a high quality of print. Colours are more vivid, details are much sharper and imagery is more refined. These benefits are unique to fabric as a result of the printing technique that is used. Fabric exhibition stands are printed using a dye-sublimation technique and it is the extreme heat and pressure involved in this process that produces the increased print quality. 2) Effortless Assembly: Display stands can often be a bit tricky and fiddly to put up, but fabric exhibition stands are the complete opposite. Comprised of lightweight, tubular aluminium frames that simply push-fit together, you don’t need tools or even more than one pair of hands to assemble a fabric display. The one-piece fabric sock slides over the top and zips up, creating the seamless, tensioned display your brand needs. 3) Increased Durability: Fabric exhibition stands offer durable properties that cannot be found in other display solutions. From the sturdy frame all the way down to the graphics, you can rest assured that a fabric stand won’t let you down by breaking. By overlocking and hemming the graphic, there is no risk of your display splitting as you apply it. In fact, you can wash, fold and reuse your graphics as many times as you like without incurring any damage. That means no cracking, peeling or fading of your graphic design, allowing you to retain that like-new look and feel at every event you attend. 4) Variety: Rarely are there exhibition stand ranges that include all of the things you need to create an entire exhibit. Our fabric display range covers everything. You can invest in a back wall, a banner stand, a promotional counter, a hanging structure, a printed tablecloth and an LED lightbox without straying away from fabric. We also offer arches, a meeting pod, outdoor displays and more; all of which fall under the fabric exhibition stand range. Having so many products within its realm, fabric displays mean you can effortlessly create a uniformed exhibition stand. 5) Value for money: If you’re looking for an exhibition stand with exceptional attention to detail, minimal assembly effort, unrivalled longevity and the biggest range and variety, then fabric exhibition stands are a perfect choice; especially when you consider their budget-friendly price tag. From as little as £199, you can have a premium fabric display that will last you a lifetime. 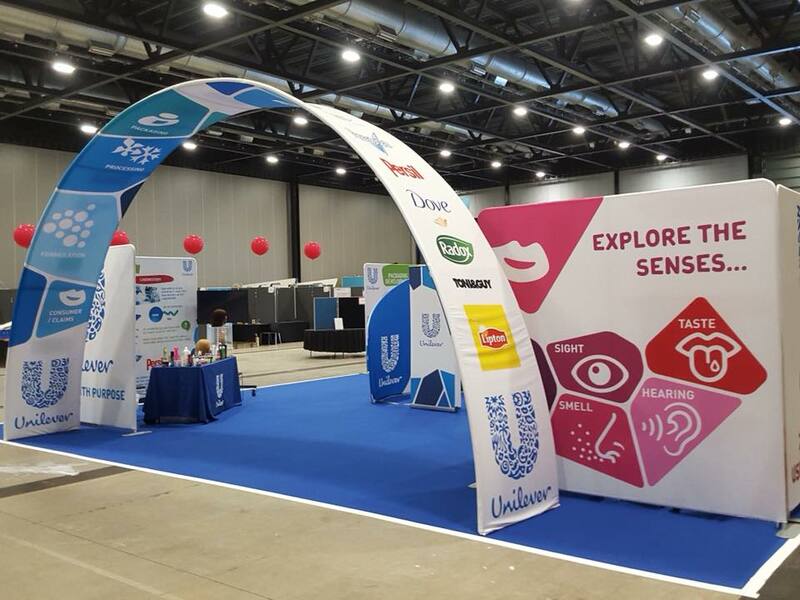 This display we supplied for Unilever is made almost entirely of fabric. From the 6m arch all the way to the branded tablecloth; there is no denying that the whole exhibition stand looks more vibrant and vivid than the rest; not to mention how seamless and tensioned the graphics are. Due to the extra crisp and sharp finish that fabric exhibition stands offer, photography-focused backgrounds are an excellent choice. 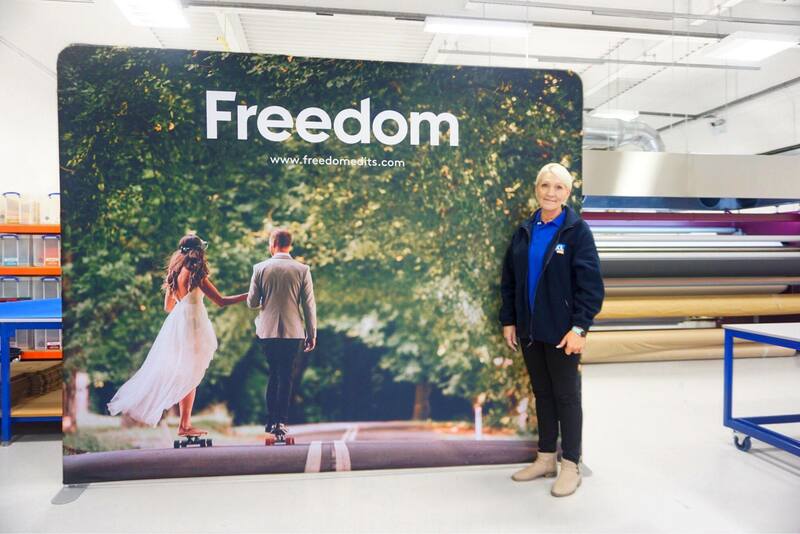 This display that we produced for Freedom Edits had such a refined finish that it made it onto the list of our favourite exhibition stands. If you would like any more information about our Fabric Exhibition Stands, contact us or call 01733 511030.